Sam Brownback’s approval ratings as governor of Kansas are dismally low, yet polls show Donald Trump winning Kansas. How can both of those things be true? It does not make sense for Kansans to boo Brownback, but vote for Trump. Over the last year, Brownback has consistently polled in the 20% approval range, the lowest of any governor in the nation. That almost unimaginable level of repudiation from Kansas citizens stems directly from his failed “Kansas experiment.” Brownback and his legislative allies cut income taxes in a big swoosh four years ago on the premise that the tax cuts would bring jobs and economic prosperity. Instead, the tax cuts broke the state budget and imperiled education, highways, and key services without delivering the promised economic jolt. The experiment, which primarily benefitted the wealthiest Kansans, did not “trickle down” to middle or low-income Kansans. Rather, with the loss of credits like the food sales tax rebate, and increases in sales tax rates, lower-income taxpayers now pay more than before. 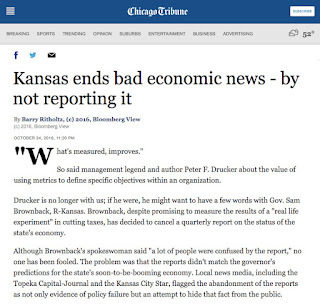 Kansans noticed, and blame Brownback for the trouble. But wait! Donald Trump has an almost identical economic plan: cut taxes sharply for wealthy Americans on the premise that this policy brings economic prosperity. He proposes creating the same kind of loophole for “business income” that Kansans have come to understand as deeply unfair. Past promoters of the Kansas experiment are now key members of Trump’s economic team. Same thing! Seductive words in the beginning, but the plan doesn’t work. Kansas provides powerful evidence. Certainly this presidential election is more than a referendum on economic plans. Voters must weigh many important and complex issues. For Kansans, though, the economic plan should be a prime one. After all, it’s our issue. We are the ones in the front row seats, the on-the-ground witnesses to what happens when leaders go down an irresponsible path. If you like what Brownback has done in Kansas, Trump may well be your guy. However, to the majority of Kansans who are Brownback disapprovers: Giving Trump our six electoral votes, even by the slimmest of margins, would foist our troubles on the rest of the nation, and show that we have not yet fully learned the lessons from the Brownback years. —This entry was originally published this week in a variety of Kansas newspapers. The hard evidence is in. The bulk of benefits from the income tax cuts that broke the Kansas budget went to a small number of wealthy individuals, while Kansans at the low end of the income scale actually paid more. The Kansas Department of Revenue publishes an annual report containing many tax collection statistics. Data on individual income tax receipts takes time to appear, but the 2015 annual report (page 22) now shows information for tax year 2013, the first year the tax cuts were in effect. The annual report from a year earlier (page 22) provides tax year 2012 stats. Place the two sets of information side by side (chart below), and it becomes easy to see how the benefits were distributed. A $700 million tax break! Did the lowest income Kansans receive any of that? No. Taxes for those making $25,000 or less actually increased, from a $16 million credit in 2012 to a $12 million payment in 2013—a $28 million swing. The next income levels up have a slight tax break, but hardly noticeable. The majority of the benefit—about $400 million—went to about 20,000 returns with an income level of $250,000 and up. Note that Kansas Adjusted Gross Income (KAGI) drops about $6 billion from 2012 to 2013. Did the real income of Kansans actually go down that much? No. Federal Adjusted Gross Income for those years does not show that drop (see IRS tax statistics) because it still includes “business income.” The first year that Kansas completely exempted “business income” from Kansas tax liability was 2013, which when excluded, causes KAGI to go down and yields up a tax break mostly for people in the highest income category. Kansans with the lowest income paid more. Kansans with the highest income received an enormous tax break. That is not speculation. That is not an estimate. That is precisely what happened, and continues to happen each year. And remember that these numbers only reflect what occurred with the income tax. 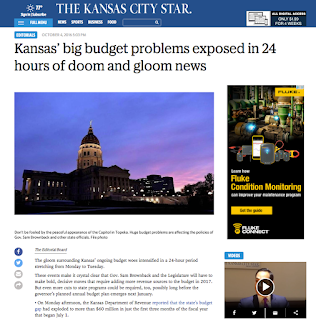 They do not show the effect of sales tax rate increases that gave Kansas the highest sales tax on food in the nation, or increased fees for services, all of which take a much larger percentage bite from the incomes of Kansans with the least wealth. A small group of high-income individuals got a giant tax break. 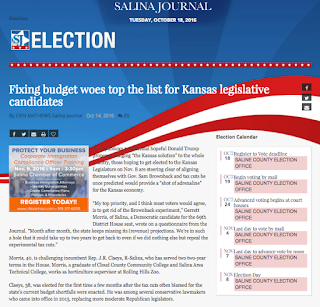 Kansas got severe financial troubles, poorer services, a budget that does not work, and economic indicators that lag behind our neighbors and the nation. * Note: Tax years correspond to calendar years. 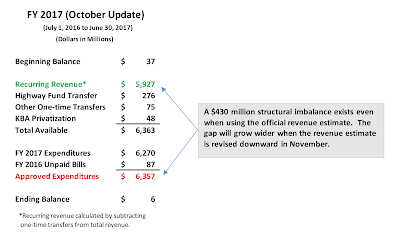 In terms of fiscal years, income tax revenue dropped $701 million in FY 2014 and then stayed down at that very low level in FY 2015 and FY 2016.